At the 130th Annual Session of the Connecticut State Grange, a new State Master was elected and installed. 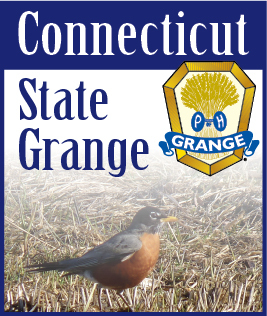 My name is Noel Miller, your next State Master (President) of the Connecticut State Grange. I am a 40 year member of Coventry Grange #75, Master of East Central Pomona #3 for the past 18 years, and past State Ag. Director, East Central Pomona Deputy, and Assistant Steward and Steward. My wife is Marcia, we have been married for 14 years, she had two children from previous marriage, our oldest lives in Seattle, WA and works for Google, and your youngest just moved to Boston and works at Lessall College in Newton, MA. My family members are all Grangers, I am the youngest of six (the baby). I was in 4H with a sheep project. This taught me hard work and record keeping skills. I was in the FFA, at Storrs Regional, as President I gained public speaking and parliamentary skills. I have belonged to my local volunteer fire department for 34 years, serving as Chief two different times. I graduated from UConn’s Radcliffe Hicks School of Ag. And worked on a commercial dairy farm before working at the Dairy Farm at UConn’s Storrs campus. In 2013 I retired from there after 31.7 years of milking cows there. I am old school in values and lifestyle. I go to Sunday family dinners. My father taught us kids life skills, community service, church, family and hard work (he taught me ditch digging so I had a backup skill). I have asked Don Lanoue of Cheshire Grange #23 to be my General Deputy. As State Session we have filled man committee slots but many are empty. Please be patient while we pull together the State Grange Pink Sash team together. I was asked how I slept after the elections, I told them that I had a dream like “A Christmas Carol” but with Grangers past, present and future. I hear people talk about Grange ritual as old and outdated, in some ways you’re right but the lessons that they teach us is life changing. It gives us instruction on how to improve ourselves, its simplicity has withstood time. I wish to thank the Camerons for their help, support and assistance with the transfer of leadership of the State Grange. I also wish to thank the Nicholson’s of Montana, our National Representatives, for their offers of friendship and guidance through the National Grange Convention in Ohio. Thank you all. I wish to congratulate every Grange that received awards at State Session, through your hard work and dedication to your projects, everyone is a winner, your members, the community and the Grange. Good luck in the upcoming year. I wish to thank Edith Schoell and Philip Bergquist, for their service as Secretary and Treasurer, and congratulate them on receiving their titles of Emeritus to their respective offices. As Thanksgiving approaches we must take time to spend with family and friends to enjoy all that we are thankful for in this past year, but we should also look to help neighbors and strangers who have struggled to make ends meet. I know through Grangers generous donations that we will brighten others Thanksgiving Day with food donations and fuel assistance. This is what makes me proud to b e a Granger in Connecticut, your heartfelt giving to others. In closing, I and my family wish you and your family a Happy Thanksgiving, and a great new Grange year. God Bless all!